Join the discussion on our forums! Come discuss Gilded Gargoyle over in our dedicated Gilded Gargoyle discussion topic. You hear a coin rattling inside the slotted gargoyle...What could it mean? 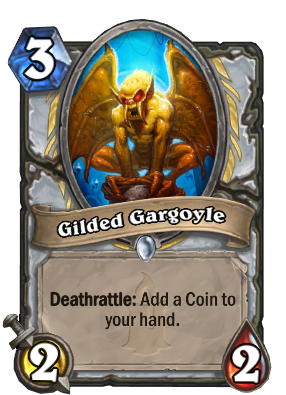 Now my 36/36 OTK inner charge priest has a coin so i can do the 11 mana vanilla combo without going second. So, Velen + 2x midblast in standard? Priest is getting Rogue cards, while Rouge is getting Mage cards. Hearthstone shifts. Sounds familiar? Priest is new Rogue. White is new Black. Who told you about my quest razakus priest??? didn't saw they pulling this out of the hat. The priestish Sorcerer's Apprentice was not enough, lets keep giving them more combo stuff. Oh wow the SECOND bad priest card (other one is temporus).